The Theropod Database Blog: Is Linheraptor a synonym of Tsaagan? Is Linheraptor a synonym of Tsaagan? One of the first theropod papers of 2015 is Xu et al. 's defending Linheraptor as being distinct from Tsaagan, after they were synonymized by Senter (2011) and Turner et al. (2012). I provisionally synonymized them on the Database because Turner's arguments seemed sound, though I haven't actually studied the problem myself. One interesting aspect here is that this paper is basically a criticism of the details and methods of Turner et al., which was basically a published version of part of Turner's (2008) thesis. Yet Norell is a coauthor, who was not only a coauthor of Turner et al., but also Turner's advisor for his thesis. Unfortunately, after reading Xu et al. 's arguments, my conclusion is that a LOT of work went into arguing a point no one disputes- the holotypes are not identical. The authors make a huge point of the number of characters they found which differ between the holotypes- sixty-one. Also that many of these are found in some dromaeosaurids, but not others. Xu et al. correctly state "Proposals of synonymy are usually based on a judgment that putative diagnostic differences between the taxa in question are individual, ontogenetic, or sexually dimorphic variations rather than taxonomic ones, making one of the new taxa invalid. Taxonomically informative variations can sometimes be distinguished from intraspecific ones if a sample large enough to provide a basis for rigorous investigation of patterns of variation is available." They then say "In the present case, Evans et al. (2013), Senter et al. (2012) and Turner et al. (2012) attributed the proposed diagnostic features distinguishing L. exquisitus from T. mangas to individual intraspecific variation, but avenues for testing this hypothesis are limited because each species is currently represented only by a single individual." Well, no. You don't need the exact species under consideration to study the extent of individual variation, you can use relatives. Turner himself had the right idea to use the multiple known skulls of the closely related Velociraptor mongoliensis as the basis for judging differences between Tsaagan and Linheraptor. Xu et al. 's response to this is rather comical- "a comprehensive taxonomic review [of Velociraptor] has yet to be published to determine how observed morphological variations relate to inter- or possibly intraspecific factors. This can be addressed by including all Velociraptor specimens in a specimen-level phylogenetic analysis, by using morphometric methods to quantify the variation present and by deepening our understanding of the biological significance of the variations observed. Until this work has been completed it is in our view that noticeable variations between L. exquisitus and T. mangas are grounds for taxonomic separation." So until we perform these studies which have been published so far for zero (specimen-level phylogenetic analysis), ?five (using morphometric methods to quantify the variation present) and ?zero (deepening our understanding of the biological significance of the variations observed) Mesozoic theropods on Velociraptor, we can't treat multiple specimens of it as one taxon? That's a bit of a far goalpost, don't you think? The morphometric studies done on other theropods haven't even resolved their taxonomy (e.g. Allosaurus, Archaeopteryx), so I'm skeptical a similar study on Velociraptor would yield useful results either. If we were to extend Xu et al. 's demands to other taxa, we'd basically have to say we know nothing yet of intraspecific variation in Mesozoic theropods. Differences between the Tsaagan (first and third rows) and Linheraptor (second and fourth rows) holotypes. After Xu et al. (2015). Xu et al. include extensive comparisons to other dromaeosaurid taxa for each difference noted. They say "Taken together, the distributions of these features among dromaeosaurids not only demonstrate that L. exquisitus is a valid taxon distinct from T. mangas but also provide important information on dromaeosaurid interrelationships." Yet in almost every case, there's only one skull known for each other taxon as well. Thus if e.g. Tsaagan shares a character with the Dromaeosaurus holotype not found in Linheraptor, yes it could mean that's a phylogenetically useful character uniting the first two genera, but it could also mean it's an individually variable character that the one preserved specimen of Dromaeosaurus happens to share with the only specimen of Tsaagan and not the only specimen of Linheraptor. You'd have to see how the character distribution worked out in total, as if e.g. Tsaagan and Dromaeosaurus shared a lot of derived characters not found in Linheraptor, that would be increasingly good evidence for a phylogenetic signal (or sexual dimorphism or ontogenetic change, I suppose) instead of coincidence. Needless to say, Xu et al. do not do this and indeed find even more characters shared between Tsaagan and Linheraptor. My basic response to Xu et al. is "Could I find 61 comparable differences between two skulls and necks of specimens near universally agreed to be Tyrannosaurus rex? Yes I could." Indeed, in every example I've looked into, from Allosaurus to Microraptor to Archaeopteryx, every specimen differs in numerous other ways from every other. Importantly, the differences never sort themselves into mutually exclusive pools, so that instead of Morph A having traits ABCD and Morph B having traits 1234, we instead get a specimen with 1B34, one with 123D, one with A2C4, one with 12C4, etc.. So either every known relatively complete and described Mesozoic theropod individual is its own species, or Mesozoic theropods had significant individual variation, just like living organisms. I know which option I choose. 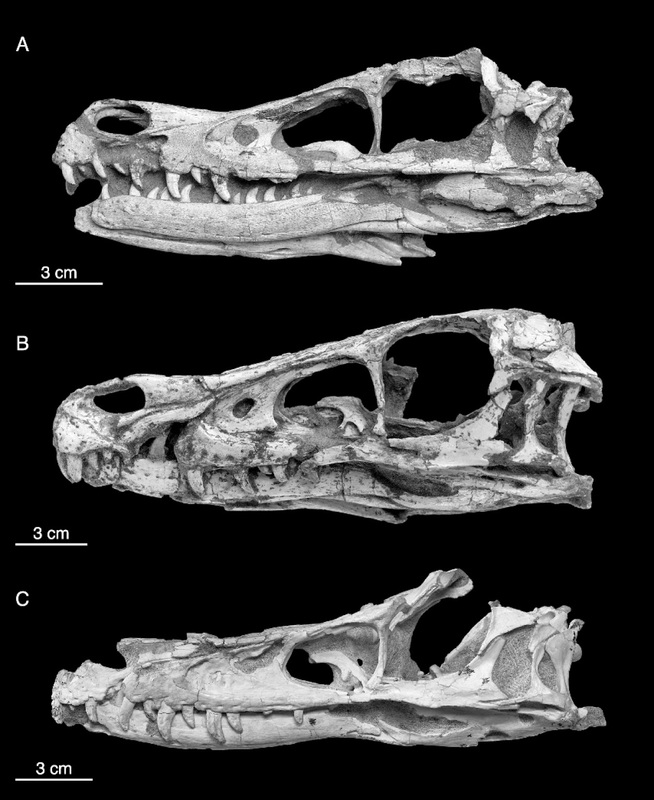 Variation in three Velociraptor mongoliensis skulls. Top- holotype AMNH 6515, middle IGM 100/25 (fighting specimen), bottom IGM 100/982. 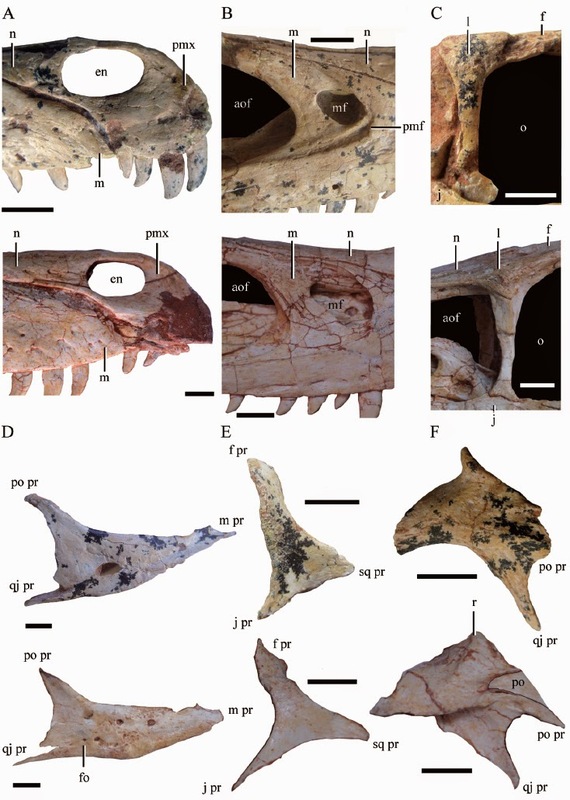 Note the numerous differences (anterior premaxillary angle in holotype, maxillary fenestra shape in top two, anterior antorbital fenestra shape, ventral lacrimal process angle in 982, posterior jugal outline in holotype, etc.). After Norell et al. (2006). To finish up the criticisms, I find Xu et al. 's statement that "In some taxonomic studies, some taxonomic indicators have been based on superficial rather than detailed morphological comparisons" to be based on problematic examples. They say "Saurornitholestes and Deinonychus have been regarded as junior synonyms of Velociraptor based on overall similarities (Paul, 1988), although both are now widely accepted as valid taxa (e.g., Turner et al., 2012)." But Paul never advocated those as being the same species, merely different species in one genus. That's a completely different issue, since genera are (more) subjective and Turner's analysis even finds these to be monophyletic to the exclusion of Dromaeosaurus, the only other decently described dromaeosaurid Paul knew of (Paul questioningly includes Adasaurus as a dromaeosaurine but notes "not enough has been published for us to be certain of anything"). If the authors wanted an example of bad Paul synonymization, they had the easy target of his 2010 synonymization of Tsaagan with Velociraptor, but not Deinonychus or Saurornitholestes. "Similarly, the basal tyrannosauroid Guanlong has been suggested to be a sub-adult individual of the basal tetanuran Monolophosaurus based on the fact that the two taxa are both characterized by a cranial crest and several other superficially similar features (Carr, 2006), though this proposal has received little acceptance (Brusatte et al., 2010, 2012)." Well, Carr's argument was only an SVP abstract, so it hasn't had a chance to be detailed yet. Seems like a low blow. "In addition to considering L. exquisitus to be a synonym of T. mangas, Turner et al. (2012) scored some character states for [Sinornithosaurus] millenii based on IVPP V 169041). However, V 16904 is not referable to S. millenii for two key reasons. First, V 16904 is inferred to be more ontogenetically advanced than the holotype specimen of S. millenii (V 12811) based on fusion features (the neurocentral sutures are fully closed in the preserved vertebrae of V 16904 but are evident in at least some vertebrae of V 12811, the proximal tarsals are fused to the tibia in V 16904 but remain separate in V 12811), but is significantly smaller than the latter specimen; and second, V 16904 differs from the holotype of S. millenii in some important morphological features, such as the fact that all of the teeth lack denticles in the former specimen but have denticles in the latter." Here we have a brief example of the splitter mindset- differences equal taxonomic separation. For just a few counter-examples- the Mei referred specimen has a tibiotarsus and fused presacral neurocentral sutures but is 80% the size of the holotype that doesn't; the Sinovenator paratype has a tibiotarsus but is 89% the size of the holotype that doesn't; Microraptor specimens can have serrations on both carinae (NGMC 00-12-A), only distal serrations (holotype) or no serrations (IVPP V13320). Again, either we have a ton of unrecognized coexisting species, or species exhibit variation. As far as good points go, besides more details and gorgeous photos of the amazingly complete Linheraptor skull (e.g. both scleral rings are articulated and in place), Xu et al. are right to criticize some sloppiness in Turner's work. But they missed out on the least justified problem Turner had regarding Linheraptor- if he viewed it as synonymous with Tsaagan, WHY didn't he code the basically complete Linheraptor specimen for Tsaagan's OTU?! References- Norell, Clark, Turner, Makovicky, Barsbold and Rowe, 2006. A new dromaeosaurid theropod from Ukhaa Tolgod (Omnogov, Mongolia). American Museum Novitates. 3545, 51 pp. Turner, 2008. Phylogenetic relationships of paravian Theropods. PhD Thesis. Columbia University. 666 pp. Senter, 2011. Using creation science to demonstrate evolution 2: Morphological continuity within Dinosauria. Journal of Evolutionary Biology. 24, 2197-2216. Turner, Makovicky and Norell, 2012. A review of dromaeosaurid systematics and paravian phylogeny. Bulletin of the American Museum of Natural History. 371, 1-206. Xu, Pittman, Sullivan, Choiniere, Tan, Clark, Norell and Wang, 2015. The taxonomic status of the Late Cretaceous dromaeosaurid Linheraptor exquisitus and its implications for dromaeosaurid systematics. Vertebrata PalAsiatica. 53(1), 29-62.